The pealing of Church bells will be heard for the last time today as Christendom plunges into a week of deep mourning to commemorate the crucifixion of Jesus Christ. However, in this “island paradise” which has become a destination, tourists will start to jam at the various beach resorts in Panglao and Anda giving a peak by Good Friday. Today, Palm Sunday, marks the triumphant entry of Jesus riding on a donkey into Jerusalem as the faithful exultantly wave blessed palm fronds during Holy Masses in the various churches of the Diocese of Tagbilaran and Diocese of Talibon. The traditional blessing of the palm will highlight all masses today, one of the longest during the Lenten season in all churches in the country. Bishop Alberto Uy will officiate today’s Palm Sunday rites at 9 a.m at the St. Joseph Cathedral while Bishop Patrick Parcon leads the same rites at the Talibon Cathedral. 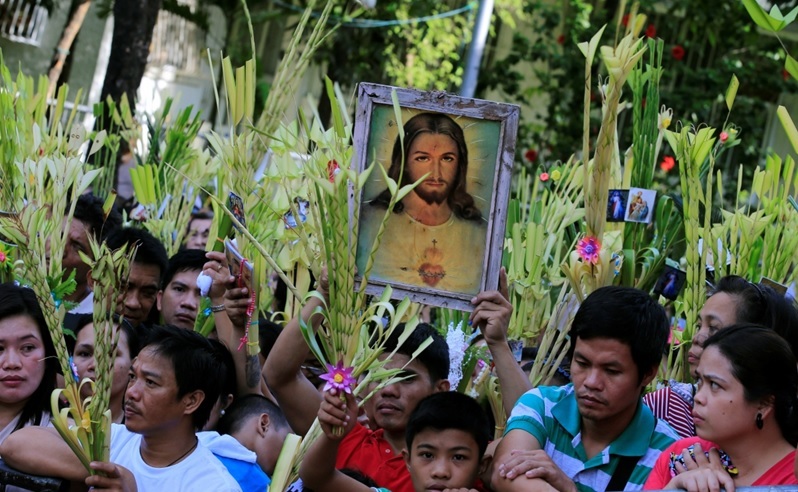 Tomorrow, Holy Monday will start the weeklong activities to commemorate Christ’s crucifixion. Priests will have their recollection from 9 in the morning until noontime. Confessions will be held in various churches. At the St. Joseph Cathedral, Holy Hour starts at 1 p.m. The priests will have their Station of the Cross starting at 3 p.m. The Chrism Mass will be officiated at 4 p.m. tomorrow to be assisted by all priests. The recollection for the laity will also start tomorrow. On Wednesday, which is also known as the “Day of Betrayal,” will recall how Judas Escariot plotted to deliver Jesus to the chief priest in consideration of 30 pieces of silver. On Wednesday afternoon, following the 5:15 p.m. mass for Our Lady of Perpetual Help will be the procession of images along the streets, depicting Biblical events which led to the crucifixion of Jesus, our Savior. At the St. Joseph cathedral, Bishop Uy will officiate the Mass of the Last Supper and the Washing of Feet of the Twelve Apostles at 4:45 in the afternoon. The bishop and lay ministers will lead in the procession of the Blessed Sacrament inside the Cathedral. There will be an all-morning vigil by different religious organizations which will be followed by a three-hour remote control broadcast of the Via Crucis and preaching of the Seven Last Words of Jesus Christ by different preachers. At 3:30 p.m., Bishop Uy and Bishop Parcon will officiate the Passion of Our Lord, to be followed by the Veneration of the Cross at the Diocese of Tagbilaran and Diocese of Talibon, respectively. At 12 midnight on Saturday is the Mass of the Glorious Resurrection and the traditional “sugat,” which will be officiated with the men and women, starting from different points, converging at the various churches. Station DYRD-AM and Kiss 102.3FM will go on lenten programming starting Maundy Thursday. Radio drama depicting the sufferings of Christ will be aired over dyRD-AM while special musical lenten programming will be heard over Kiss 102.3FM with teachings of Bro. Bo Sanchez from Manila. The recitation of prayers will be beamed from dyRD studios during the procession on Wednesday and Friday while the Seven Last Words will be carried live from the St. Joseph Cathedral.